In my attempt to 'think deep,' I wondered, 'If wearing an excessive amount of clothes to avoid paying excess luggage fee could be classified as an offence by BA, how come the open grazing of someone's farm by the cattle of herdsmen, is not seen as one in Nigeria?' On my way to the office days ago, the cars ahead of me suddenly came to a stop. I immediately concluded that it must be another police check point. I was wrong. A young cattle herder was leading his cattle across the road in a location that is almost built up. 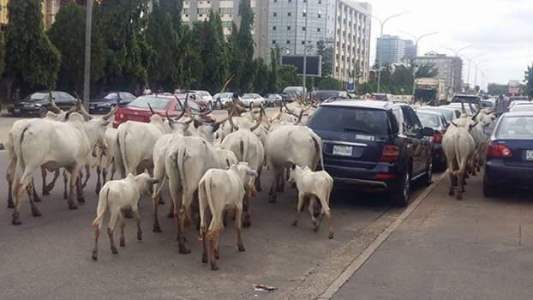 Have you observed that these herders and their cattle don't obey traffic rules? Not Zebra (or even cattle) crossings, traffic lights nor pedestrian bridges, where they exist, yet none has been arrested for traffic offence. As I pondered on this, I recalled Exodus 22:5 that says, 'If an animal is grazing in a field or vineyard and the owner lets it stray into someone else's field to graze, then the animal owner must pay compensation from the best of his own grain or grapes.' Hmm!!! Think about it, if open intrusive grazing was an offence hundreds of years before Christ (BC), it is shocking why some will consider it otherwise over 2000 years after the death of Christ (AD). When the rest of the world has gone ranching in line with biblical and best practice, Nigeria is debating cattle colonies. Na wa! This cattle colony debate reminds me of the dark past when lepers colony was common. Could it be Nigeria is operating in year 1000BC? It seems logical that the compensation for destroying the crops of one man is replacing it with the best of your crops. Makes sense, right? But can someone please explain why human lives are taken in place of stolen cows. Because the only reason the umbrella body of the herders have given for the slaughtering of villagers is that their cattle were rustled. One would expect that the compensation should be the produce of the farmers and not the lives of the farmers, except of course in the estimation of the herders, cows are equal to human. My take is, until we recognize that we are a nation with laws and enforce the law irrespective of who is involved, we are living in deception, because while the rest of the world is counting forward in AD, we are moving backward in BC. .....Just the thoughts of a certain Wey Mey. How are we Influencing our Children?